Children are not the demographic most commonly associated with sleep apnea, but they are capable of being affected by it. Pediatric obstructive sleep apnea occurs when a child stops breathing during sleep, usually because of a blockage or obstruction in the airway. The effects of pediatric obstructive sleep apnea are much different than adult sleep apnea, as adults customarily suffer from daytime fatigue while children exhibit behavioral issues. Children with pediatric obstructive sleep apnea may begin performing poorly in school, have difficulty concentrating, and begin acting out. According to the American Sleep Apnea Association (ASAA), an estimated 1 to 4 percent of children suffer from sleep apnea, many being between 2 and 8 years of age. The ASAA said studies suggested that as many as 25 percent of children diagnosed with attention-deficit hyperactivity disorder could actually have symptoms of obstructive sleep apnea. Most parents can tell when their children are having difficult times sleeping, but they are frequently clueless about what to do when they have concerns. If a parent suspects their child might have sleep apnea, the ASAA recommends seeking out a pediatrician who specializes in sleep disorders. The ASAA states that polysomnography “is the only tool for definitive diagnosis and assessment of the severity of pediatric obstructive sleep apnea.” Polysomnography is more commonly referred to as a sleep study. A child may be more likely to have pediatric obstructive sleep apnea if they are overweight, have a family history of sleep apnea, have Down syndrome or cerebral palsy, suffer from mouth or jaw issues impacting breathing, or simply have a large tongue. In most cases, the cause of pediatric obstructive sleep apnea is enlarged tonsils and adenoids. Surgical removal of the tonsils and adenoids is the most common treatment for pediatric obstructive sleep apnea. The ASAA reported that such operations result in complete elimination of pediatric obstructive sleep apnea symptoms 70 to 90 percent of the time. When adenotonsillectomy does not completely resolve the symptoms, positive airway pressure (PAP) therapy may be recommended. PAP therapy could also be prescribed before surgery in some cases. 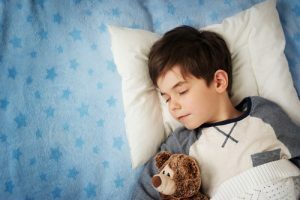 Some children who exhibit sleep apnea symptoms may suffer from a condition known as pediatric sleep-disordered breathing (SDB). According to the American Academy of Otolaryngology–Head and Neck Surgery Foundation (AAO-HNSF), SDB is a general term for breathing difficulties during sleep that can range from frequent loud snoring to obstructive sleep apnea. SDB involves many of the same symptoms as pediatric obstructive sleep apnea. It also commonly involves the same treatment, as removal of the tonsils and adenoids often resolves many issues related to SDB. Silent Night Therapy helps people resolve sleep apnea issues. Call (631) 983-2463 or contact us online to let our team help you explore your sleep options.